FILE - A helicopter lands on the Izumo, Japan Maritime Self Defense Force's (JMSDF) helicopter carrier, at JMSDF Yokosuka base in Yokosuka, south of Tokyo, Japan, Dec. 6, 2016. Japan is building up its influence in the South China Sea, the most widely contested body of water in Asia, to curb Chinese expansion and garner support for its broader military as well as economic interests. In May, Japan will send its Izumo helicopter-carrying warship to the South China Sea for three months of port visits in Southeast Asia before directing it onward to the Indian Ocean for drills with the United States, according to the U.S. Naval Institute’s news website. China’s foreign ministry spokesperson reacted Thursday to the word about the warship by urging that Tokyo “refrain from causing trouble in the region” and “respect related countries' efforts to maintain peace and stability,” according to the official Xinhua News Agency. Japan does not claim the South China Sea, a 3.5 million-square-kilometer body of water prized for fisheries and possible undersea fuel reserves. Six other governments call all or part of it their own, creating friction since the 1960s. 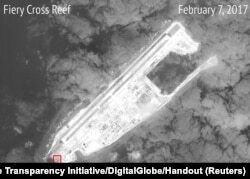 Over the past decade China has angered the others by using landfill to expand tiny islets and built military installations on some to fortify its claim to about 95 percent of the sea. Japan, which does have maritime territorial disputes with Beijing in the East China Sea, will send the ship as part of a longer-term effort to vie with China’s influence in Southeast Asian coastal states while cooperating with the United States to bolster a broader power base in Asia, analysts say. The United States hopes to stop Chinese island-building in the South China Sea and ensure freedom of navigation, an agenda that has angered Beijing but found a match in Tokyo. Japan also cares about the safety of undersea communications infrastructure and China’s compliance with international laws, Koh said. Japan and China dispute the eight uninhabited Senkaku Islands in the East China Sea. Analysts say Tokyo’s influence in Southeast Asia, along with its close U.S. security relationship, could draw wider sympathy to its Senkaku claim. Tokyo controls the islets, which are 200 nautical miles (370 kilometers) southeast of Okinawa and called the Diaoyudao in China. It regularly reports spotting Chinese military aircraft flying over nearby waters. Japan wants to form a “united front” with Southeast Asian countries, said Carl Thayer, emeritus professor of politics at The University of New South Wales in Australia. Brunei, Malaysia, Vietnam and the Philippines contest parts of China’s maritime claims in the South China Sea. China and Japan already vie for economic influence in Southeast Asia, a hotbed for investment and a vibrant consumer market of about 600 million people. Japan has given the region development aid since the 1950s. Last year it pledged to raise the amount. The aid builds political relations while keeping doors open for low-cost investment by Japanese factories. Vietnam and the Philippines are exploring ways to cooperate with China over the disputed sea, adding urgency for Japan. China offers aid and investment to much of Southeast Asia as well. 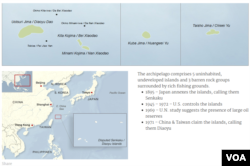 Japan’s foreign ministry said last year it hoped China would “comply with” a July 2016 world arbitration court ruling against the Chinese claim to about 95 percent of the sea. The Philippines had filed for the arbitration. China rejected the ruling. “Japan is continuously proactive in terms of providing assistance to the ASEAN (Association of Southeast Asian Nations) countries in terms of conducting ... patrols in the region and also sending the warships to ASEAN countries, very much in line with their emphasis on the rule-based behavior,” said Andrew Yang, secretary-general with the Chinese Council of Advanced Policy Studies think tank in Taiwan. China’s dialogue with other countries had “improved” relations in the region, Xinhua said. Beijing distrusts Japan for what it perceives as an unrepentant stance for its pre-World War Two invasion of mainland China. It also frets over the Japan-U.S. military alliance that U.S. Defense Secretary James Mattis reaffirmed in February. China is used to Japan’s influence in Southeast Asia, analysts say. Japan sent three amphibious ships to the Philippines in 2013 for relief after Typhoon Haiyan killed about 6,300 people in the Southeast Asian country. Last year, Japan gave the Philippines two patrol vessels and said it would lease training aircraft, adding to an earlier offer of 10 coast guard ships to an otherwise militarily weak nation. Japan agreed in 2014 to sell Vietnam six used maritime surveillance vessels and two months ago pledged to sell it six new patrol ships. Expect a "continuation" of Japanese military cooperation in Southeast Asia, Thayer said.